Cranberry, orange zest, lemon zest and touch of white chocolate muffie, if a muffin and a cookie had a baby they would make this. For me, my favorite part of a muffin has to be the top. The rest of the muffin might be too much when I eat it and sometimes I just want a top. It has toppings, at time a slight crunch and I believe the most flavor. The first time I heard of a muffie, a combination of a cookie and a muffin, was from a chain cafe restaurant that my mother and I go a couple of times a year. When she first saw them for fell in love with them and now when we go there she gets almost all of them. Like I said in the title, a muffie is a combination of a muffin and a cookie. It is in the shape of a cookie but has a fillings of a muffin and softer. 1. Preheat oven to 325 degrees. Line two to three cookie sheet with parchment paper. 2. In a medium size bowl, whisk together 3 cups of flour, baking powder, baking soda and salt. Set aside. In a large mixing bowl, beat together eggs, cooled butter and sugar on medium until light and fluffy. Stir in vanilla extract, orange juice and sour cream. 3. Slowly add in flour mixture on a medium speed. Toss orange zest, lemon zest, dried cranberries and white chocolate in the last 1/2 cup of flour. Fold into batter until well incorporated. 4. Spoon out batter 1/4 cup of batter with 2 inches space apart. Smooth with wet fingers. Bake for 14 to 15 minutes or until a toothpick comes clean. Rotating pans halfway through. If they are not fully cooked on the inside after 12 minutes, cover with a piece of parchment and bake for 2 to 3 minutes. You probably only need to do that for the first batch, that's what happened to me. 5. Remove from oven and let cool for 5 minutes on pan then transfer to a wired rack to cool completely. 6. Store in an airtight container for up to a week. I love, love, love baking muffins and these cranberry orange muffins sound delightful! I can't wait to try them! "Muffie" - I love this title and I love this recipe! These muffies sound delicious - I love the idea of them being a combination of cookies and muffins. Such delicious flavours too. Wow I am drooling over these. Muffies!!! what a great invention. I am so not a fan of baking but these make me want to make some just to satisfy my cravings and the steps are so easy! These sound delicious. I've never heard the term muffies before to describe these cookies but I love it! Hmmm. Never heard of muffies. I love the portmanteau derived from the two names muffins and cookies. Brilliant. Now muffies have got to be in my to Do list. Starting with these ones. Thanks for sharing. These sound amazing! I love orange cranberry anything and can't wait to try them! These muffins have such beautiful flavors and I would like to try this recipe at home. Love the combination of Vanilla, Orange, Cranberry and Chocolate! These muffins have such beautiful combination of flavors and I would like to try this recipe at home. Love the combination of Vanilla, Orange, Cranberry and Chocolate. These Cranberry Orange muffies look great! I love this combo of flavor. Yum! I love cranberries and oranges. Definitely trying these. These sound so delicious and seem easy enough to make! I think I need to give them a go and test them out for myself! 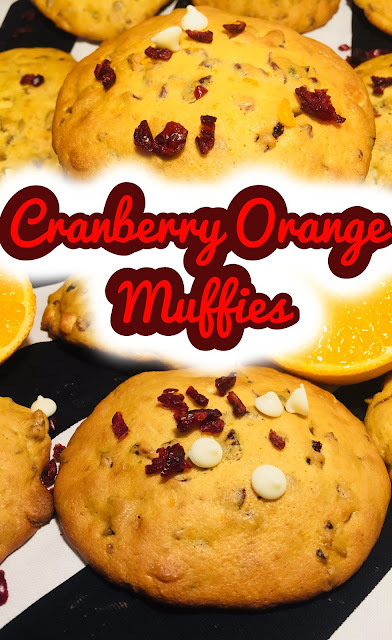 Cranberries and orange are such a wonderful combination of flavors and taste, the muffin should sure taste good. I need to try this out. Cranberry Orange Muffies look so good! I would like to bake them on weekends. I have fresh cranberries after baking last week. I think it would be an interesting test. They would be a bit more sour likely. Oh my! How good do these look! So good! Need one now!!!! This sounds like a great flavour combination. Craisens are so healthy, too! I should have came across this recipe last week for my husbands birthday. He is a fan of cranberry and I know he would have enjoyed this. Thanks for sharing. Oh, I just heard about a muffie from you. Orange is my favourite flavour. I really have to try them out. Cheers!! I am badly craving in to this. Looks likes delightful and tasty. The kids will love this for sure. Let me go ahead and try this. Yummy!!! I love muffins like this! These look amazing and tasty. I would love to try one, the orange and cranberry excites me because I don't think I have ever explored such flavours. Another wonderful recipe!! Love the combination of cranberry and white chocolate. Delicious!! Omg the muffie is amazing! I have never heard of this but it is two of my favourite things! Thank you for sharing this wonderful recipe I will definitely have to give it a try! Wow! this is so inviting and appetizing... Nice recipe, will love to prepare this someday. These actually look so delicious. I was a little worried about the orange/cranberry mix. I absolutely love this flavor combo!! I bet these are amazing! These are one of my favorite to pick up from local store. Nice to see that i can easily make it at home too!